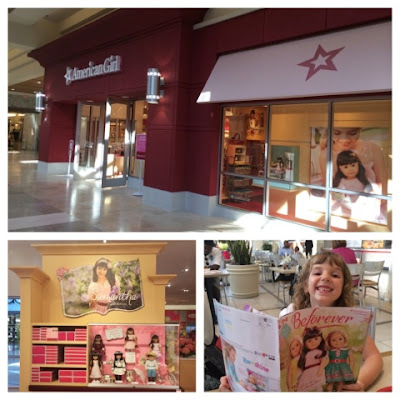 My daughter, 6, and I had little idea what American Girl dolls were until Friday when were invited to a preview of the Charlotte American Girl store at the South Park Mall. 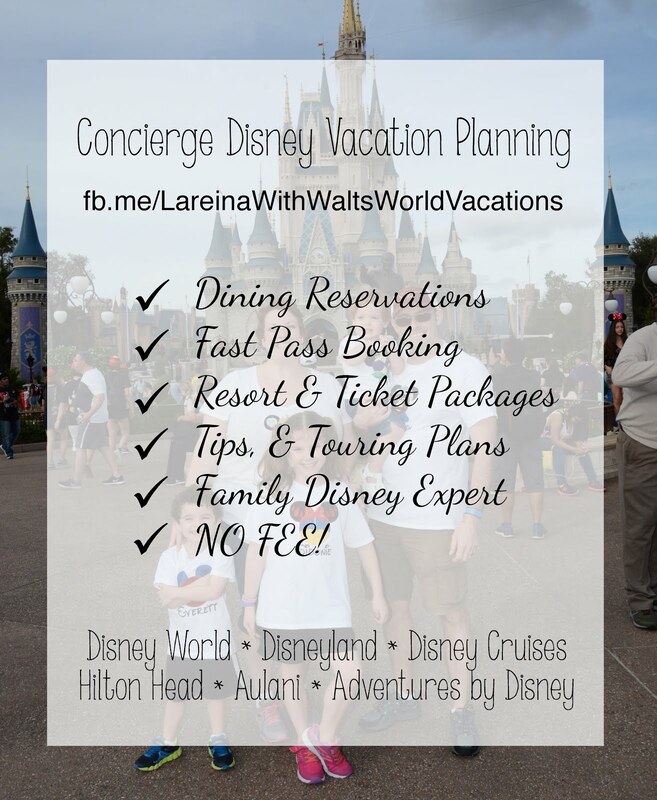 I had done some preliminary searching and saw the pricing online, and I can't lie - I was skeptical. But, after our hour visit we both left swooning over the pink and purple girly-ness of it all. 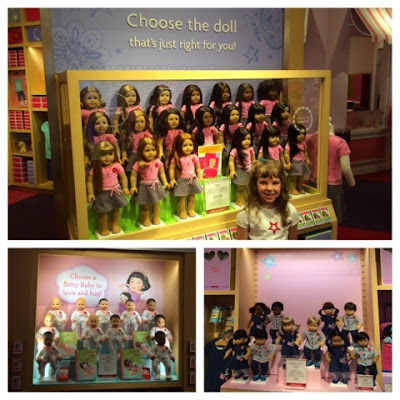 The American Girl store is more than a store, it's an experience. Walking in the door I was impressed with the ambiance, it plays like a doll store and collectors museum in one. Groups of ornately dressed dolls are staged in glass cases, featuring the fashion and accessories of each time period. If you're not familiar with American Girl dolls, each of the BeForever collection dolls hail from a different era and feature books with stories about what it was like to live during that time, along with themes that connect these characters to the hopes and dreams of modern day girls. I liked the wide range of features available for the dolls with many skin, eye and hair colors and hair textures. Girls are able to pick out a doll they relate to, and add features like freckles or braces. 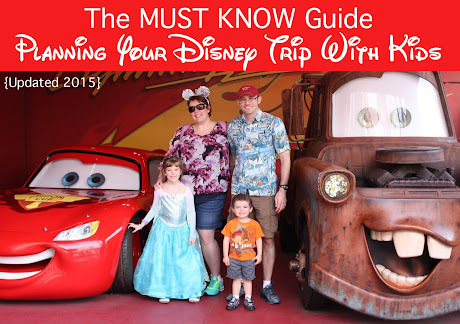 They offer matching clothes for girls and dolls and every accessory under the sun. The BeForever and My American Girl dolls are recommended for ages 8+. Bitty Baby dolls are also available with similar options for ages 3+, in addition to Bitty Twins and pets. They have a bookstore section full of books about the dolls, their adventures and workbooks and craft sets. 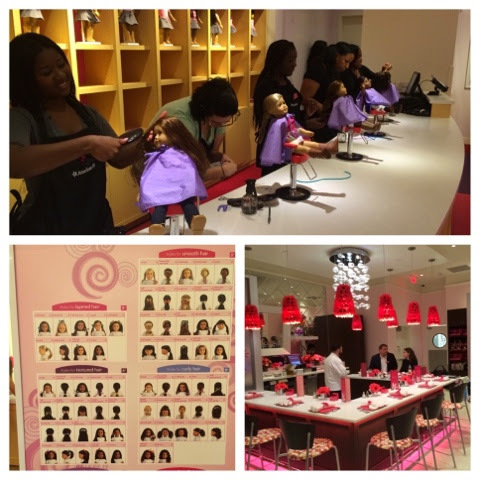 The American Girl store is a posh place for dolls, with a beauty and hair bar. Dolls sit atop styling chairs (strapped in - that made me smile) while their hair is restored and restyled to their out of box condition. They also pierce doll ears and create custom matching t-shirts. There is a lot to take in, so famished moms and girls might need a bite to eat between rows of dolls and accessories at the American Girl Bistro. They also host birthday parties with loaner dolls for guests attending. Whether you’re looking to browse and learn about American Girl dolls or are an avid collector this addition is just another great reason to head to South Park Mall for a uniquely girl-fun experience. We have been reading the Samantha book at home, which allows the reader to make choices about how the story plays out. S absolutely loves this feature, and even though there are no pictures has been enthralled with the story and I’ve enjoyed reading them to her as well. MomAboutCharlotte.com Disclaimer: We received 2 books, a work book and a Samantha doll to facilitate a review of this brand, as well as a Samantha doll to give away to a reader. As always my opinion is my own, and I only share what I love with my readers. Dads and Charlotte breweries, some things just go hand in hand. 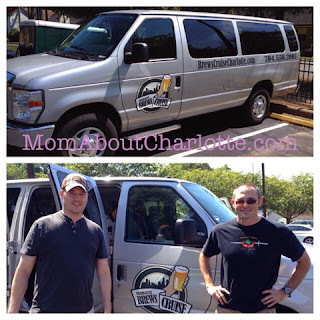 The Dads of Mom About Charlotte ventured out on a beautiful fall day with Charlotte Brews Cruise tours to weigh in on all things pilsner, ale and lager. Top notch Charlotte based microbreweries have been popping up around the NoDa (North Davidson) area for the past several years. 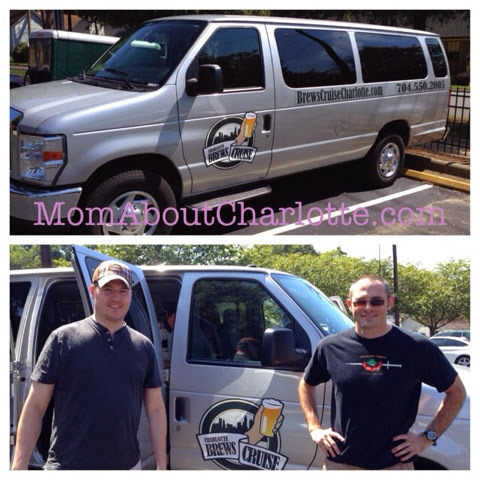 My IPA loving hubby Jim, and ale aficionado brother-in-law Gary boarded the Charlotte Brews Cruise van for an afternoon of beer education and tasting. 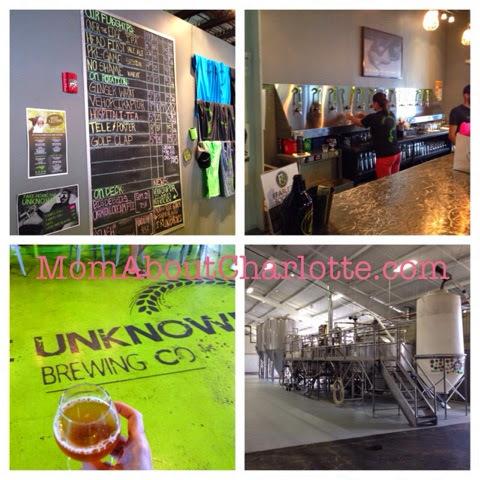 They toured three breweries: Birdsong Brewing Company, The Unknown Brewing Company and finally Heist Brewery. 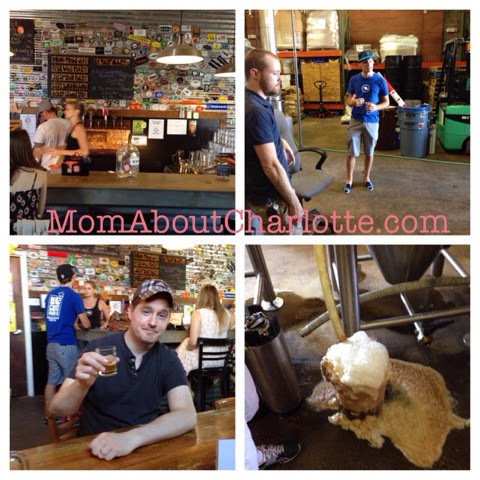 Birdsong, known for serving up the most affordable growlers in Charlotte, gave the guys a full tour of their brewery. They explained the brewing process, showing the specific grains and malts they use to create their award winning flavors. They explored the brewery floor (with beer in hand) and got to taste a flight of five of their hand picked brews - including their very unique jalapeno pale ale. Scott the tour guide gave a little background about each of the samples prior to tasting, allowing novice and experienced tasters alike to connect to each brew. Jim and Gary's favorite was the Higher Ground IPA. Having Scott and Hannah as tour guides created a laid back VIP atmosphere at each brewery. Their rapport with employees and tour goers translated into a fun welcoming way to meet new people with similar interests (I <3 beer). They were very knowledgeable about beer and the Charlotte microbreweries and history. Next up was The Unknown Brewing Company, whose founder Brad Shell has a rich micro-brewing pedigree, hailing from previous engagements with Sweet Water, Terrapin and Rogue Breweries. With their close proximity to BOA Stadium The Unknown Brewing Company sells plastic half growlers perfect for thirsty tailgaters. The ambiance has a modern feel, the brewery floor is visible from the tasting area with plenty of room for future growth. The brews are innovative, including the perfectly southern tea-based Hospitalitea beer. Jim's favorite was the Over The Edge IPA and Gary's was the Ginger What. Last was Heist Brewery, which specializes in twisted American cuisine and handcrafted beer. Heist offered the widest range of brews - something for every taste. Heist Brewery hosts tall ceilings and wide open spaces speckled with high top tables and outside seating. 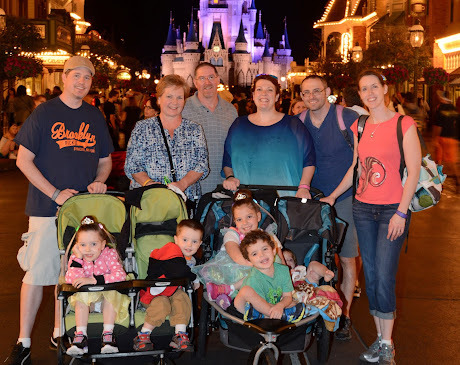 The guys agreed this was the best place to drink and dine, and you could do it with your friends or with kids in tow. Jim's favorite was Cross Pollen Nation and Gary's was The Out To Pasture. Going on the Charlotte Brews Cruise Tour offered the guys the chance to sample beer that they wouldn't normally try - Gary had never tried a ginger beer but loved the Ginger What. Jim was a fan of the jalapeno pale ale, but if we were at dinner probably wouldn't have otherwise risked ordering it as an entire beer. It expanded their palette and was a lot of fun. When my sister and I arrived to pick them up 3.5 hours later our husbands had happy beer smiles and enjoyed getting out for some guy time. They were able to purchase their favorite beers to bring home and stored them in the van's cooler. Charlotte Brews Cruise provided waters and snacks during the tour. The tour was given four thumbs up by the guys and they look forward to their next tour. Public Saturday tours cost $49 per person, and private tours start at $54 per person. 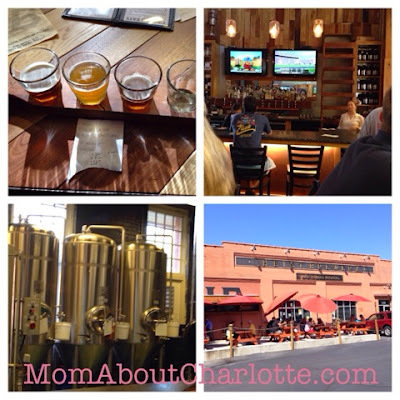 You can keep up to date on all things brews by following Charlotte Brews Cruise on Facebook, Instagram and Twitter. MomAboutCharlotte.com Disclaimer: I received a free happy husband and brother-in-law for my review of Charlotte Brews Cruise (their tours were comped). However, as always my opinions are always my own and I only share what I (or I by association) love. As soon as I'm not preggo or nursing I plan to join Scott and the gang on a tour myself.